I haven’t baked my own birthday cake since the ripe old age of 13. That was over 30 years ago! Why you ask – well that was the year my great mother Patty put me in charge of making my own birthday cake while she went off gallivanting. Waldorf Astoria Red Velvet Cake no less. I was excited and thrilled! Until the frosting – one part is milk heated with flour that must be COOLED BEFORE adding it to the bowl that’s got butter and sugar that’s been bwhipped to the bejesus. Welllllll I didn’t let the milk part cool enough and proceeded to finish the cake. When Patty came home she started to yell at me YOU DIDN’T LET THE MILK COOL! There was more blah, blah, blah and belly aching and I’m sure she wanted to call me an IDIOT – oh wait she probably did! I said I did, I did let it cool! Patty “OBVIOUSLY YOU DIDN’T” – it was obvious – the frosting was all melty and saggy and very sad. Me: Well it’s MY CAKE! Then I ran to my room crying. Thanks for the memories Patty! Happy Birthday Mary! So after a lot of therapy. I am now able to once again attempt my own b-day cake. Oh and did I mention? It’s John’s birthday too (Aug 1st). I always think her cakes are a little on the short side so I upped the batter half again as much as she calls for. Not shown in picture – this is what I will do if I make it again. I’m not going to lie – this cake was difficult in that it really needed to be COLD to almost freezing to hold up well. Actually it was a big soupy mess – and it’s not even hot outside – but I figure it’s what I get for telling on my GREAT mother Patty – another saggy runny mess!! That’s why there’s no photo of a whole cake in all its glory. Hopefully next time with the addition of the extra gelatin I won’t have a problem! And let me say that it was so divine in flavor I can’t wait to tackle it again soon! Now if you’ll excuse me I need to go do some dishes! This was a lovely cake! Light, airy and flavorful! Mix until it goes back down to soft peaks – which is pretty quick. SIFT one third over the cream mixture and FOLD in until just blended – repeat two more times. Pour into 3 greased and floured and/or parchmented round cake pans – this is a sticky one. When cake is finished baking and cool – brush a third of the mixture on each layer. Wrap well and freeze or refrigerate. It’s so important to do this a day in advance! It will make assembling your cake a dream and not a sloppy mess! Bring to boil then simmer until fruit is soft. Transfer to a blender and make a puree. Heat for 10-15 seconds in microwave until dissolved then mix with remaining puree. I purposefully put in a lot more gelatin because you need that mousse to be so firm just like jello! so it will hold the weight of the cake layers. Cook and smash until they’re juice is out. Put mixture through a sieve to get the seeds out. Reserve 1/2 Cup for garnish. Use half for raspberry puree with sugar and fold these in together. Set aside wrapped up in the fridge – let it set! 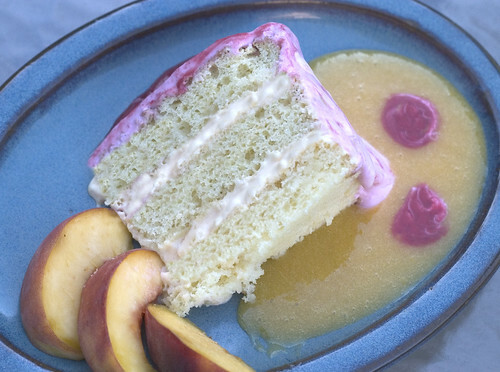 Use the OTHER HALF and fold in the peach puree that’s got the gelatin. Wrap up, place in fridge and LET IT SET! Stack cake with the non-moussed layer on top. Frost with Raspberry frosting and refrigerate a-2 hours before serving. Garnish each plate with a little of each of the reserved puree. well happy bday to you, glad the trauma didn’t scare ya for you life! But wow — it sure sounds delicious! Great flavor combo — and definitely birthday appropriate! Hope you had a happy day!! Ah, the memories of your near-perfect upbringing. According to MY recollection I was going to WORK (to afford ingredients for your cake, no doubt.) And my TENDER admonition to READ THE RECIPE was CAREFULLY CONSIDERED before QUIETLY MENTIONING, due to your tendency to weep or rage at even the SLIGHTEST criticism. AND, though emotionally scarred (poor Portia), you continue to bake cakes! HAPPY BIRTHDAY WEEK END TO YOU AND JOHN!!! I bought fresh peaches yesterday and made peach cobbler, I forgot how great fresh peaches are! I plan on buying more, very soon. This cake looks fantastic, even if it did melt a tad! This cake sound super, although a 3 day lead time is a little demanding. If someone made it for us, we’d be appreciative though! Haven't baked anything since school & gosh, that was like more than 20yrs! Thks for sharing! Mary, Happy Belated Birthday to you and John! Just got back from a trip and I see the delicious photo of your cake. I wish I could have just a slice of it right now. Thanks for sending me this post.